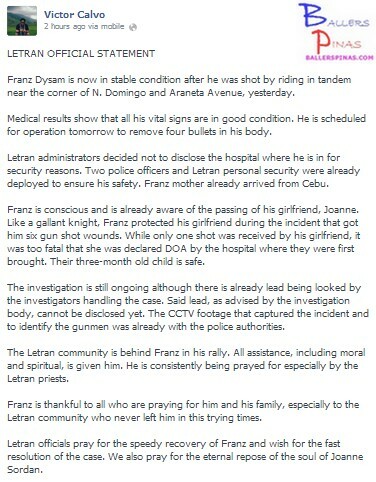 The Colegio De San Juan de Letran has finally issued an official statement regarding the very sad shooting incident involving one of the members of their Men's Basketball Team, Franz Dysam. Fr. Victor Calvo of Letran posted the school's official statement on his Facebook Account. He shared that Franz is now in stable condition after he was shot by riding in tandem near the corner of N. Domingo and Araneta Avenue, yesterday. But unfortunate, his wife passed away.